This past weekend as I was driving home from Tobermory, my husband and I were sucked in by the siren-call of a flea market. Couldn’t help it. The gems you’ll find in these little country towns are unparalleled and they’re literally a fraction of the prices in Toronto (of course). So, as I was making my way through the booths I see this sweet little Chihuahua sitting on top of one of the tables on a little blanket. I approach politely (on a curve with my side facing the dog) and say a little “hello puppy” in my best chirpy voice (those of you that know me are well acquainted with this particular voice). Instead of a hello, I’m met with some serious disdain. She growls, stiffens and shows me her teeth. Being a trainer, I happily said, “fair enough little one, I’ll move away”. I was happy to move on to more shopping. However, when the owner sees this he’s surprised and embarrassed. He says, “Oh that’s weird, she’s been letting people pet her all morning”. He then proceeds to go to her, and rough her up playfully as she is cries for him to leave her alone. He’s saying “don’t be a grumpy pants” and “whose my crusty little girl” as he jams his head and face right next to her exposed teeth. Yikes. There were a few warning bells here to say the least. So where did he go wrong? Dogs spend their whole lives learning to speak human. And they’re amazing at it. They fill in the blanks of our sad attempts at communication in a way that brings tears to my eyes. We, however, spend almost no time learning what THEY have to say to US. If you take a little time to learn, you’ll see that your dog is literally screaming at you with his postures and his facial expressions all day long. I can’t remember who said it but I love the quote, “All behaviour is information”. Try to get out of the trap of thinking of some behaviour as “good” and some as “bad”. Bad behaviours are more likely to be punished. Punished behaviours are more likely to stop happening. Now all you’ve done further limit your ability to know how your dog is feeling. When my dog growls I say thank you. When my dog licks his lip I know he needs a little break. When my dog shows his teeth I intervene on his behalf immediately. Every warning sign he gives me makes me better able to predict a bite, and better able to manage his environment. I know exactly what he doesn’t like and exactly when he’s had too much. And he never needs to resort to aggression to get his point across. How much easier must his life be for having a mom that hears him and respects him? Firstly, the man brought his dog to a market where hundreds of people will want to come through and molest his dog. Instead of being his dog’s advocate, he was exposing his dog to every type of pinching, poking and squeezing imaginable. Secondly, he placed his dog on TOP of a table. The poor dog couldn’t get away or even hide somewhere safe. Dogs have three options: fight, flight or freeze. Right out of the gate this poor dog had only two of those options available. I’m willing to bet that dog spent all morning completely frozen while people petted her without even noticing she was miserable. God bless her tolerance for our ignorance. When she’d finally had enough and realized that her communication wasn’t being heard she turned up the volume. Enter growling and snarling. NOW people start leaving her alone. Ironically, the one person that should have been protecting her was the one person still ignoring her pleas. If you insist on bringing your dog to a busy area, make sure you give him a place to retreat to. FLIGHT is always the best option available to our dogs. If he had simply placed a small crate under the table he would’ve had a much happier dog at the end of the day. better over the years at getting around this problem. The best way is to literally narrate your way through what you’re doing. I pretend as though I’m talking to my dog: “Oh yes, little man, we’re just going to back away because we don’t always like to be touched by strangers”, or “Isn’t it so nice how I give you treats while scary people are around?”. I’ve found people are much more understanding if I fill them in on exactly what I’m doing and why I’m doing it. That being said, people can be mean. It’s better to make someone angry than to subject your dog to constant attention that he really doesn’t want. There, I’ve said it. All in all, let’s try to start being the advocates that our dogs desperately need. Give up the need to have a dog that likes everyone, all the time in every situation. 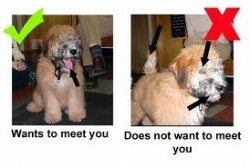 Instead, start to learn who your dog likes, what he likes and how he likes it. I can promise that your dog’s trust in you will grow in a way you’ve never known before.